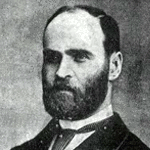 Alexander Macfarlane was a Scottish-Canadian logician, physicist, and mathematician. Macfarlane, the inventor of hyperbolic quaternions, was very active in research and education. His resume includes stints as a physics professor at the University of Texas; a professor of Advanced Electricity, and later of mathematical physics, at Lehigh University; and co-founder and president of the International Association for Promoting the Study of Quaternions and Allied Systems of Mathematics. He wrote the popular 1916 collection of mathematical biographies Lectures on Ten British Mathematicians and a similar work on physicists, Ten British Physicists of the Nineteenth Century. FCIT. "Alexander MacFarlane author page." Lit2Go ETC. Web. 23 April 2019. <https://etc.usf.edu/lit2go/authors/45/alexander-macfarlane/>. FCIT, "Alexander MacFarlane author page." Accessed April 23, 2019. https://etc.usf.edu/lit2go/authors/45/alexander-macfarlane/.